Every employee in Germany is legally entitled to participate in a so-called “betriebliche Altersvorsorge”, also abbreviated in German as “bAV”. 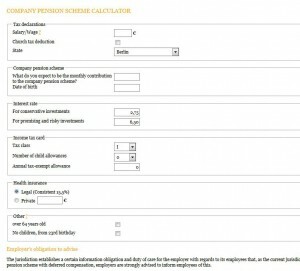 These are company pension plans which allow the employee to have parts of his gross salary transferred directly into his personal pension plan. Because of this, you can save the taxes which would normally be deducted from this part of your gross salary as well as social welfare contributions (the latter only if your gross salary is below 60,000 EUR p.a., though). You can compute the benefits for yourself (tax savings) and even for your employer in this neat little tool by clicking on the picture below. If you need some assistance in filling in the right data (such as tax class, deductions etc. ), do not hesitate to contact us, we’ll be happy to help you. 1. If your gross salary is below 78,000 EUR p.a., you can invest up to 260 EUR per month from your gross salary with full tax savings AND savings for social welfare contributions (such as public pension deductions etc.). You can add, if you like, another 260 EUR p.m. – but this then allows you only tax savings on the additional 260 EUR each month. Basically the maximum monthly amount you can contribute with, for instance, a Direktversicherung or a Pensionskasse is 520 EUR p.m. as per January 2018 and after. 2. If your gross salary is above 78,000 EUR, you will “only” enjoy the tax savings but not the savings on social welfare contributions. You can also put in a total of 520 EUR p.m.
3. If you are a high-earner or director of your own company (UG, Ltd., GmbH etc.) you can also add even more monthly contributions with a so-called Unterstützungskasse (U-Kasse). Here you are entirely flexible with how much you put in every month (though some limitations may apply with regards to the balance between actual salary and pension contributions). Even if you have already reached the limits with a Direktversicherung at 520 EUR p.m., you can for instance add another 480 EUR into a U-Kasse each month if you would like to put away 1,000 EUR monthly from your gross salary. The difference for employees legally here is that your employer is not obligated to let you invest in a U-Kasse – in contrast to the Direktversicherung as mentioned above. Therefore you’ll have to negotiate this with your employer. But for important employees/managers there is usually enough leverage to get this accepted by an employer, particularly as there are only small costs involved on the side of the employer.